Secretary of State Mike Pompeo often makes one thing very clear in interviews and public remarks: His love for his adopted home state Kansas. But his first visit to the state since becoming the top U.S. diplomat has reignited rumors about his political future there. "I love Kansas. It's home for Susan and me for sure," he told a local radio station Monday. Pompeo is in Kansas on his third stop on a three-state domestic tour – an unusual move for the country's foreign emissary, but one largely seen as trying to shore up support for President Donald Trump amid his trade battles with China, Mexico, and others. Pompeo is addressing the Road to the Global Entrepreneurship Summit in Overland Park – a State Department-run event in partnership with the Netherlands before they host the full summit in June. Last week, he spoke at an energy conference in Texas and the week prior to farmers in Iowa. But while there's been speculation that he will run to be Kansas's senator in 2020 or governor in 2022, Pompeo himself has tried to downplay that. "I try to just avoid ruling things out when there's others who are in control," Pompeo told McClatchy's Kansas City Star and Wichita Eagle. "The Lord will get me to the right place." 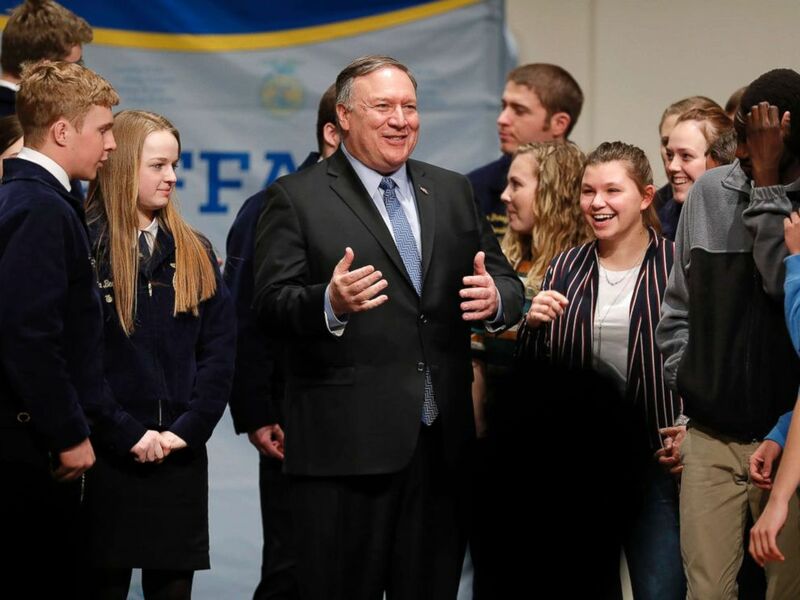 Secretary of State Mike Pompeo, center, talks with students after speaking to the Future Farmers of America and Johnston High School students, March 4, 2019, in Johnston, Iowa. "But I know this much, I've seen a lot of the world and I dearly love the people of Kansas," he added. Those comments have sparked renewed talk on Pompeo's future, as he is one of Trump's most trusted advisers. A California native and West Point and Harvard Law School graduate, Pompeo served as a three-term congressman from Kansas before becoming Trump's CIA Director and now Secretary of State. His swift rise and close relationship with the president and Republican leadership have fueled speculation about what he will do after Trump's first term. Senate Majority Leader Mitch McConnell met with Pompeo earlier this year, urging him to run for the Senate next year when the Republican-held seat is vacated by retiring Sen. Pat Roberts. But despite saying he tries to "avoid ruling things out," Pompeo did just that on a Senate bid, telling NBC News in February, "It's ruled out... I'm going to be the Secretary of State as long as President Trump gives me the opportunity to serve as America's senior diplomat." President Donald Trump talks to Secretary of State Mike Pompeo during a cabinet meeting in the Cabinet Room of the White House, Aug.t 16, 2018. Pompeo has said he would like to move back to the state, and while next year's Senate race may not be in the cards, the state's governor is currently a Democrat and up for reelection in 2022. 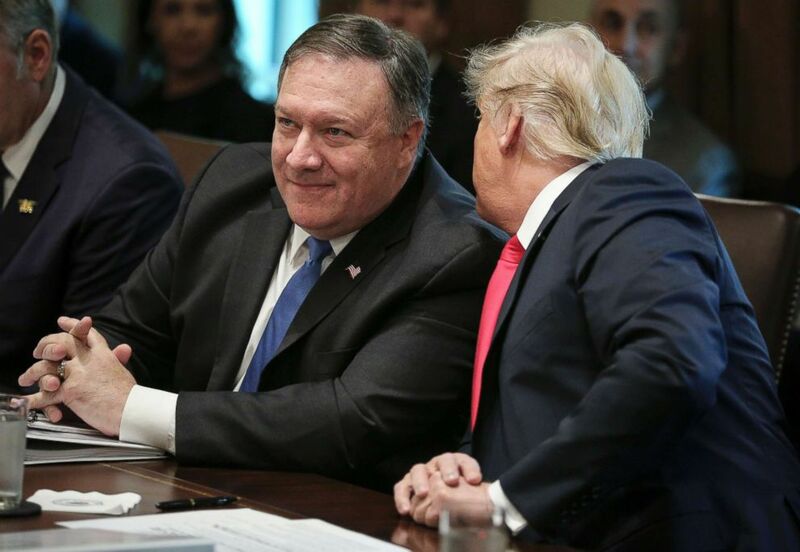 "It's a terrible quandary because he may well be the strongest and most capable cabinet member Trump has," Fred Berry, a Kansas businessman who was Pompeo's congressional campaign co-chair, told McClatchy, saying he wants Pompeo to run. "He won't be there forever." Regardless of what he chooses next, after being a two-time member of Trump's cabinet, Pompeo's future will be closely tied to the remaining two years of the president's term. In several interviews with local Kansas radio and television stations, Pompeo was asked repeatedly about Trump's trade battles and the economic pain for farmers and manufacturers and his nuclear talks with North Korea, amid signs that the regime may walk away after the no-deal summit in Vietnam. "You're doing such a great job by doing all that. We love that," the Lukas and Careth In the Morning show told him Monday. "That's very kind... Susan and I miss Kansas, we miss you all as well," Pompeo responded.